Where V I Lenin once stood, AD Technology is now broadcasting videos. 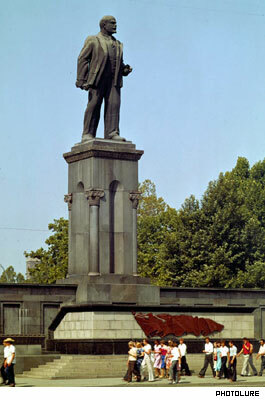 Where once Vladimir I. Lenin stood bronzed and pointing the way to socialism, an electronic billboard now stands in Yerevan's Republic Square, broadcasting capitalism and the best of Hollywood action movies, and video clips from the former dictator's nemesis, the evil west. When workers were busy putting up the evergreen State Holiday Tree in late December, other workers were equally busy constructing the 8 x 6-meter industrial gray monitor. Visitors to the square who might have thought the giant screen was there only for the holiday festivities are now learning that loud music and MTV images are likely to be a long-time fixture in the otherwise solemn and stately square. Moving ever closer to achieving Wild West aspirations, Armenia had its first gun show last week. Organized by the Union of Hunters and Fisherman of Armenia, the show and sale attracted about 35 to 40 to the opening out for a look or a purchase of weapons. My attention has been brought to the issue for about six weeks now, for, living near the square, I am never more than a decibel or two away from a reminder that a jumbo-sized television occupies turf that formerly belonged to Vladimir Ilyich Ulyanov, aka, Lenin. Each year before the Day of St. Sargis Manush Soghomonyan and her friends prepare for one of the year's most mysterious and interesting traditions. "Just like many youngsters, every year I'm impatiently waiting for this day," says 16 year-old Manush. "It's a day which can reveal many secrets of your future." This year the Day of St.Sargis in Armenia is celebrated February 7. It is sort of like Valentine's Day, but with Armenian nuances. Last February when thousands demonstrated against presidential election violations, passionate speeches from politicians were followed by actor Vladimir Abajyan's, who recited a poem: "People are different"
on the shoulders of the world. The words belong to Paruir Sevak, and perhaps no others could be so in tune with speeches about seizure of power, fraud and injustices. And even if another such poem does exist it probably is one of Sevak's. Last week the vernisage in Saryan Park was filled with not only paintings but also with unhappy painters. The park, across from the Opera House, is usually empty during winter months, but became active due to Mayrakaghak (Capital) Union of Artists non governmental organization which organized a demonstration for artists' protection. Many gathered. But it turned that only a few knew why. Card Controversy: Opponents of identification system decry "human labeling"